Could the $200 'Green' PC with gOS Linux Become a Threat to Apple? As some of you may have read, Walmart is selling a $200 "green" Everex PC, which runs a customized version of Ubuntu Linux known as gOS. 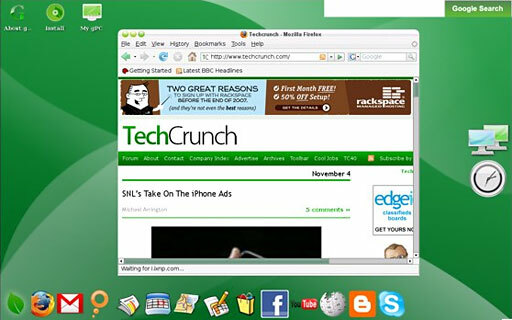 It's designed around access to Google applications for basic functions. The system itself is pretty basic, with a 1.5 GHz VIA processor, 512 MB of RAM, a CD-RW/DVD-ROM "combo" drive, and an 80 GB hard drive. This reads like top-of-the-line for 2003, and $200 essentially buys you just that - except at a fraction of the size. The motherboard is the mini ITX standard, which means it is only 6.7"/17cm square (the motherboard has a slightly larger footprint than the 6.5"/16.6cm square Mac mini, which is only 2"/51mm tall). There is a PCI slot, 2 USB ports, an ethernet port, and built-in video. The case, however, is a standard sized minitower (about 24"/60cm square), which research indicates is most popular amongst Walmart customers. The gOS - a "green" operating system (from TechCrunch). The system, however, is not the key part of the offering. The most interesting part is that it runs Linux - a version called gOS - and attempts to offer all desired features to a novice computer user. It features a Mac-like 'dock' at the bottom of the screen with friendly looking icons for Google Docs, Gmail, YouTube, Facebook, and Wikipedia amongst others. It also comes with OpenOffice and Firefox. The question that arises from this is whether it will threaten Apple or not, and what it means in the long run. The good news for Mac fanatics is that it probably won't draw away existing Mac users. It doesn't exactly offer the features and expandability of a Mac, and even though it does come with some applications, it doesn't offer anything comparable to Apple's iLife suite. Mid- and high-end users won't even think about this machine, due to it's lowly specs and "unproven" OS. It also can't offer the ease of use that Mac users expect from a machine. Installing software will be next to impossible, as there is relatively little commercial software that runs on Linux (unless you use a Windows emulator, which most purchasers of this won't know about). Gaming will also be difficult, as not only are there few (if any) hit games that run on Linux, but the system's specs won't allow much of anything from within the past three years to run. The most likely customers for this machine will be first-time PC buyers or someone who had been using an old Pentium-based desktop with Windows 95 or so, desperate to get into something from within the past few years without spending a lot of money. Essentially, Everex is picking up the very low end that Apple (and other companies) hasn't tapped into. They're selling to people in lower-middle income America who want a basic computer to let them access the Internet and create documents. From their initial success (the system is sold out on Walmart's website), it appears that they will be very successful. Sure, Apple will sell you a Mac mini for $599 (plus keyboard and mouse), but that's as inexpensive as they get - and that probably makes sense in order to keep the brand's image looking good. The Mac mini could be viewed as the logical step up from the Everex right now. That could change in the future, though. Everex plans to expand their lineup, with plans for a $300 laptop in the works. 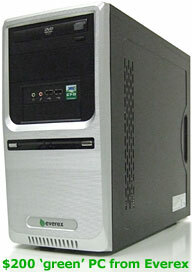 They also currently offer a similar PC desktop with 1 GB of RAM and Windows Vista Home Basic for $300. It would eventually make sense for them to expand the line upward, offering people a "next step" to upgrade to after they've bought the $200 PC and used it for a couple of years. By then, Linux may have become a serious contender in the OS Wars, and gOS may end up being a recognized brand like Windows Vista and Mac OS X are today. These models could start becoming a threat to Apple. With higher-priced, higher-spec'd models coming out featuring an alternative, easy to use, task-based operating system, it could mean some real competition in the lower end of Apple's lineup. This could only happen, however, if Everex starts shipping their PCs with access to good photo management software, moviemaking software, and other programs that rival iLife. It also would help if the case looked a bit less like a home-built PC from 1995. The other possibility could be that the $200 PC sells well initially, has many frustrated customers trying to install Unreal Tournament for their kid, and then faces a high level of returns to the store.